My ficus died. Please send condolence cards directly to the Composting Council of Canada. The December Issue of Phyiscs Today has reviews of Peter Woit's and Lee Smolin's books. The reviews aren't exactly nice, but kind of interesting and different from other reviews I've read so far. The author, Kannan Jagannathan, roughly says all this talk about the so-called-crisis is on weak feet, and The End of Physics is nowhere near by. He ends with the sentence 'Smolin and Woit appear to think that it is time to cut the short-term benefit of the doubt for string theory, but many other physicists might be willing to let a little more time pass before rendering judgement.' I agree on most of the criticisms Jagannathan raises, but I think that he's shaking off the raised concerns in both books too easily. If you still have doubts that Waterloo, Ontario is the place-to-be, let me mention that the construction area on King Street has eventually turned into the Waterloo Town Square. This doesn't only mean that PI has now a Starbucks withing 3 minutes walk (or a 10 minutes drive respectively, because you don't get out of the parking lot), but also the largest LCBO in Southwestern Ontario (that LCBO being the place where you're supposed to buy liquor). For some photos, see here. "In a faraway Cosmos, there live intelligent Dampfnudeln [a bakery]. They can travel almost as fast as light. For this they use the recoil of improved pressure cookers. [...]"
The article cites Wolfgang Lerche saying "A deep gap is dividing particle physics. String theory is forced onto the defensive.". Besides this, the article hardly contains any interesting information. If you are looking for an easy to follow introduction, I can recommend the talk. It is also quite entertaining. If you want to see a cosmologist getting upset about inflation, look at this video. Abstract: World-wide collaboration in high-energy physics (HEP) is a tradition which dates back several decades, with scientific publications mostly coauthored by scientists from different countries. This coauthorship phenomenon makes it difficult to identify precisely the ``share'' of each country in HEP scientific production. One year's worth of HEP scientific articles published in peer-reviewed journals is analysed and their authors are uniquely assigned to countries. This method allows the first correct estimation on a ``pro rata'' basis of the share of HEP scientific publishing among several countries and institutions. The results provide an interesting insight into the geographical collaborative patterns of the HEP community. The HEP publishing landscape is further analysed to provide information on the journals favoured by the HEP community and on the geographical variation of their author bases. These results provide quantitative input to the ongoing debate on the possible transition of HEP publishing to an Open Access model. And finally, if you enjoyed the Rube-Goldberg machine made out of Honda parts, you might also like this video. I think, I finally found a purpose for all my CD's that are catching dust since iPod. I can't say I was drawn to theoretical physics because I found it utterly beautiful. Indeed, I found physics in middle school extremely confusing and ugly. We were essentially presented a set of equations, and asked to measure or compute things without any apparent reason. I definitely preferred mathematics, where things seemed to have a relation to each other, and were build up on well defined and reliable axioms. I was lucky though that I had a very patient teacher who tried to explain me that all these equations actually can be derived from common principles, just that the maths necessary for this was missing in 8th grade. (E.g. the factor 1/2 in the equation s = 1/2 g t2 suddenly makes sense, when you learn what integration and differentiation is.) I realized only much later that in most of her explanations she was actually talking about differential equations, and the variational principle - what I would call one of the most beautiful concepts in physics. Some weeks ago I read an article in the October issue of Scientific American Mind "The Neurology of Aesthetics", which investigated the neurological causes of what humans find beautiful. This post is a very free interpretation of the article, and a comparably free relation to beauty in physics, since I don't think it is necessary to have college level maths skills to see the beauty of it all. 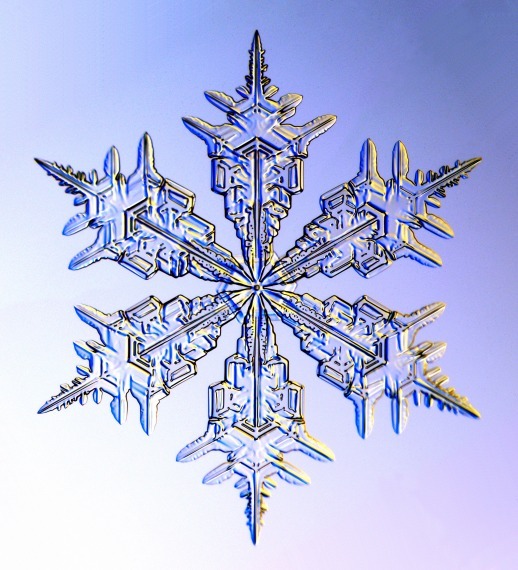 There are the obvious examples of crystal growth (see here for more snowflakes) which are based on lattices. Then there is the power of symmetries to classify a confusing amount of particles: the quark model, a brilliant example of how symmetries (in this case SU(3)) allow to explain the observed particle zoo by building them up of only some few constituents. (See here for more info about the Eightfold Way). The pictures below show probability distributions of electrons in the hydrogen atom, as one can compute with elementary quantum mechanics (pictures drawn with this applet, if you want to play around). For some real pictures, see e.g. the measurements of electron interference in high temperature superconductors at BNL. The principle of symmetries finds its most powerful application in gauge symmetries, which are the foundation of the standard model of particle physics. However, as my mother likes to say 'Symmetrie ist die Kunst der Blöden.' -- 'Symmetry is the art of the poor.' Which is true in the sense that perfect symmetry is just boring. From the photos at the beginning of this section, none has perfect symmetry. The breaking of symmetries is essential to the formation of life. It is what makes nature an interesting place. The left picture above shows a piece of the Cosmic Microwave Background, the results from the WMAP measurements. From the sizes and colors (temperature fluctuation) of this pattern one can extract information about the structures at the time of radiation-matter equality. Another example for structures in physics is closely connected to the search for a theory of quantum gravity. It is generally expected that at smallest scales (close by the Planck length) the spacetime we sit in is not a smooth background but quite messy and quantum foamy, see e.g. here for a picture and a brief introduction. Simplification is one of the primary goals in theoretical physics. Basically the whole search for a theory of everything can be thought of as a search for simplification. Some of the most compelling examples for a successful simplification are maybe the unification of (classical) electric and magnetic phenomena in Maxwell's equations, and the quantum field theory of electro-weak interactions. But simplification is not only a goal. It is also an useful tool. Think about describing the properties of vapor. You don't compute the motions of every single atom, instead you describe the whole system by some few properties like temperature, pressure and volume. Another well known example is considering the cow to be a sphere. This might be quite a crude approximation of you think about said cow as your next dinner. But If you want to describe, say, how a cow drops out of a plane and hit some innocent fisherman, it's completely appropriate to describe it as a sphere. Simplification is also behind the cosmological principle, according to which the universe is roughly the same everywhere, and looks the same in every direction. This sounds pretty silly if you look at the screen in front of you, but makes sense if you think of galaxies as particles in a cosmic fluid. The CMB structures shown above are departures from this over-simplified description. Besides being beautiful, simplification is an extremely powerful concept that can save a lot of brain time. To come to theoretical physics, it seems that humans are just fascinated by strange thought experiments like: What would happen if you could travel at, or even faster than the speed of light? If you fell into a black hole? If the electron mass was only a bit larger? If space-time was made of braids? What if you'd try to microwave a marshmallow? Describe everything as tiny vibrating strings? What if you could fly? Travel back in time? There's no doubt physicists like extremes. I was kind of surprised to see the SciAm article listing problem solving as a factor for beauty, the reason being 'When the correct fragments click into place, we feel a gratifying 'aha'.' This doesn't only make us like the picture whose 'problem we solved', but it is essentially what physics is all about: explaining the underlying concepts of things that look puzzling at first sight. 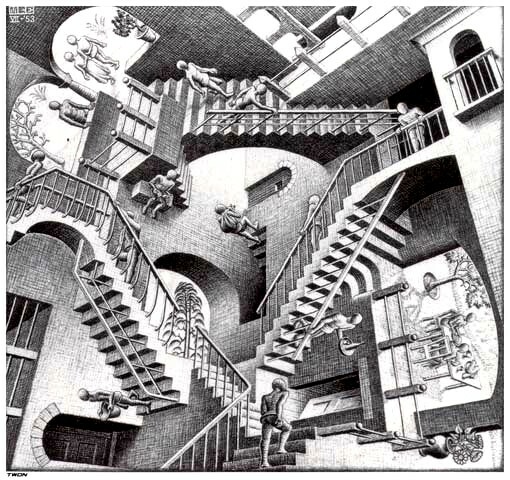 Another nice example for the fascination caused by problems are maybe also Esher's impossible pictures. An additional point that doesn't relate to beauty in theoretical physics is that of a visual metaphor which draws its relevance from the historical and sociological context. And if you want to get a perspective of how our concept of beauty is affected through the media, look at this video. ... when things just work? "This Advertisement for the new Honda Accord was shot in real time with no CGI involved in the sequence. It required 606 takes and cost $6 million to shoot and took 3 months to complete. Title: How can AdS/CFT be useful for heavy-ion physics? On Tuesday, I missed another seminar on the subject, but as the seminar schedule tells me, on Thursday there will be even another seminar by Andrei Starinets. It's not that I am so tremendously interested in the topic, I just find it remarkable how much fuss there is around it. Despite the fact that Pavel started his talk with a very nice motivation about RHIC experiments, I could not avoid noticing the sharp contrast between his predictions, and the predictions I am used to from nuclear physics talks. The latter of which usually include some plots of calculated observables, how well they fit the actual data points (and error bars to both if necessary). Based on this, a conclusion on the quality of the model should be given, and how they compare to other approaches. It seems to me that the AdS/CFT calculations haven't yet quite reached this state. We just concluded quark matter. At the theory summary, in what was supposed to be the closing session, the guy speaking (Larry McLerran, a pretty famous person) went on a 20 minute rant on string theory in general, attempts to use it to describe RHIC in particular, and Brian Greene in personal. See Larry McLerran's talk (PPT), slides 19 onwards for what I am talking about (the slides do not convey his tone, e.g. giving Brian Greene a "Pinocchio award"). In any case, an amusing closing talk to conclude a somewhat politicized (no surprise) but fun (as always) conference. Please don't ask me details about the talk, as I mentioned, I didn't hear it. This is just to convey some skepticism from 'the other side'. Update: See also Clifford's post Nuclear Guy goes Nuclear at Asymptotia, and Lubos' post Heavy Ion Physics and AdS/QCD. Welcome to the Gravity Party! ... that the Baconian method is suitable also for vegetarians? The table of degrees ("tabula graduum") lists the increase and decrease of the given phenomenon in one object or in different objects. This third table [...], should bring us to know the formal cause (law) of the phenomenon itself. It is not always easy to arrive at a formulation of the law [...]. In such a case we must be content with a temporary or working hypothesis, and await new instances, new experiments." The recent results from high redshift supernovae, and the implications for our knowledge about the nature of dark energy (constraints on the equation of state), are a nice example for 'new instances' that can be included in the 'tables'. Hopefully, the new data will eventually allow us to extend our current 'working hypothesis'. So far, dark energy still is essentially a parametrization for some mysterious component of our universe whose origin we don't understand - but a parametrization which works annoyingly well! For more info about the new supernovae data, see Sean's post at CV or Clifford's post at Asymptotia. But back to Sir Francis: early in the year 1626, he applied his method of scientific research to investigate the possibility of using snow to preserve meat. While stuffing the chicken with snow, he contracted a fatal case of pneumonia, and died on April, 9th 1626. If you are out on the market for position hunting, this post is especially for you: Good luck, don't give up! That you can build them again"
I like the Bangles' version better. ... where the name Google comes from? The name 'googol' was invented by nine-year-old Milton Sirotta, the nephew of the American mathematician Edward Kasner, back in 1920. The word was slightly scrambled, and used to name Google, to indicate the incredible high amount of information available on the web. NASA will host a media teleconference with Hubble Space Telescope astronomers at 1 p.m. EST Thursday, Nov. 16, to announce the discovery that dark energy has been an ever-present constituent of space for most of the universe's history. -- Louis-Gregory Strolger, astronomer, Western Kentucky University, Bowling Green, Ky.
-- Sean Carroll, senior research associate, California Institute of Technology, Pasadena, Calif.
Abstract: The initial conditions for structure formation, and hence the dark matter distribution on sub-galactic scales, depend on the microphysics of the dark matter in the early Universe. I will focus on WIMPs and explain how collisional damping and free-streaming erase perturbations on comoving scales k> ~1/pc. Consequently the first structures to form in the Universe are mini-halos with mass of order the Earth. I will then describe the status of calculations of the subsequent dynamical evolution of these mini-halos. Finally, if time permits, I'll briefly overview the microphysics of axions. If you have the time and an interest in dark matter, you should invest the hour to look at it! During her talk, I noticed that in my earlier post I forgot to point out the important thing to notice in the figure below: the absence of even smaller structures in the magnification. "[...] The Honeywell - Nobel Laureate Lecture Series [is] the centerpiece of a global education initiative designed to connect students across the globe with Nobel Prize winners in Chemistry and Physics. [...] A multi-year effort, the Honeywell – Nobel Initiative combines on-campus events, interactive webcontent and broadcast programming to link one generation of leading scientists with the development of the next." "[...] and so far, no one has come up with a good alternative. But I suspect, there are some kids in junior high school [...] who will have within their minds the seeds of discovery... "
PS: Nov 11th, at 11:11 am is the official begin of the Carnival Season in Germany. Today at 2pm the live-chat at discover.com with Prof. Lisa Randall from Harvard took place. It was a very balanced text interview in which Randall answered questions from the audience that were picked by the moderator (Amos Kenigsberg). He did a good job, it was interesting, and a lot of stuff was covered. As always, Lisa Randall was good in communicating her work. Here are some of the more interesting questions (I wasn't able to copy and paste from the Java applet, so you'll have to endure screenshots). The person with name 'famous' is the moderator. In the answer I think Lisa Randall was referring to this paper on which I have commented in my post Why do we live in 3+1 dimensions. (I don't know where these brackets come from, seems to be a software bug). The question was whether string/loops/spin networks/other funny things out there can eventually turn out to be part of the same fundamental theory. And if mathematical consistency alone makes the fundamental theory unique. I agree on her answer, but it wasn't the answer to my question. Besides this, I learned that the German version of her book 'Warped Passages' was just published. It seems to be one of the rare cases in which the German title 'Verborgene Universen' (hidden universes) makes sense, and imo is actually better than the English one. Update: Thanks to Georg, I found out that 'qd_survivor' has a post 'Two answers from Lisa Randall' on the blog A Quantum Diaries Survivor, where you also find a complete transcript of the chat. The 19th International Conference on Ultra-Relativistic Nucleus-Nucleus Collisions (QM2006) will be held in Shanghai, China on November 14-20, 2006. For more information, see their website. Christine Dantas has deleted most of her blog 'Background Independence'. It makes me very sad to see her go. For explanations, see 'Dantas is missing' at PF, or the comment section at Not Even Wrong. Update: Christine has put up a partial backup of her posts. Lee Smolin has a feature article in the November issue of Physics Today, titled 'Quantum Gravity faces Reality'. If you are registered, you can follow this link. It briefly explains attempts to measure effects of, and approaches to quantum gravity (String Theory, LQG, CDT, Spin Networks). Tomorrow, Thursday, Nov 9th at 2:00pm EST, there will be an online chat with theoretical physicist Lisa Randall at discover.com . Update: In case you have also wondered how this will work, see the email below. Lee Smolin has written a letter to friends and colleagues, regarding the ongoing discussion about his book. You find the letter on the website The Trouble with Physics. I'm the editor of Discover.com, and I'll be moderating the chat on Thursday. The event is going to be a real-time, online, text-based chat, with Lisa Randall as the guest and people interested in physics -- scientists and non-scientists -- as the audience. The chat will be on theoretical physics, centered around Lisa Randall's take on the field, and it will last for an hour. At the beginning of the chat, I'm going to ask a few questions of Prof. Randall, and then we'll take questions from audience members. (I'll select the questions to make sure there's nothing offensive, way off-topic, or really dumb.) Anyone is welcome to comment and ask questions, but we want to keep things civil and generally accessible for lay people interested in science. Arguments with Randall's positions are perfectly welcome. Please let me know if you need to know anything else, and I hope to see you and your readers at the chat. ... the world doesn't always look blue and green... flying over the earth today, I found quite amazing sand formations in Takla-Makan (Desert of Death), China, (click to enlarge). If you have Google Earth, you can download my placemark from the first location here, or look it up at Google-maps here. Also interesting: try this placemark, which seems to show some wheel traces in the desert that you can follow for endless miles. Special thanks to Andi for the hint. There is a FedEx box at reception for you. To my surprise, the FedEx box turned out to be pretty large and heavy, with a sticker saying CUSTOMS CLEARED that covered the sender's address. After struggling with some kilometers of duck-tape, I exhibited my forwarded mail from the department at UCSB. I threw away a non-negligible amount of the usual advertisements, and was left with two large envelopes, in which there were further boxes, in which there were again envelopes. Speaking of crying, I took off the book's cover, under which the book actually looks like a book, and not like a cleaning agent. The other envelope contained the complete Particle Data Review, and the physicist's pocket diary, which is another step back to a normal life here in Waterloo. Besides this, the box contained a significant amount of bubble wrap. With confused thoughts about valley-seekers or tree-climbers on the marketplace of ideas, and the backlashes of advertisement campaigns, I popped some bubbles. I recalled that some months ago I read a story about the history of bubble wrap1. Bubble wrap was invented in 1957 in a garage in Somewhere, New Jersey, where the engineers Alfred Fielding and Marc Chavannes took two plastic curtains and ironed them together. The original intention for bubble wrap was to use it as a fancy and easy to clean wallpaper. Well. It seems, Americans are weird when it comes to interior decoration, but not completely nuts, so it didn't quite work out with the wallpaper idea. And if you've ever tried, you'd notice that bubble wrap isn't exactly easy to clean. I love stories like this. They seem to capture such an essential part of the American spirit. This equally stubborn and arrogant conviction that you can make it if you only try hard enough. This equally naive and charming believe in your own ingenuity. This equally foolish and tough pursuit of new ideas2. To add my European view, this story tells you also that the best advertisement isn't going to make bubbles of nothing into something they are not. And it tells you that sometimes it takes time until a good idea finds it's place in the world and can prove it's usefulness. And what a sad place the world would be without bubble wrap! I remember how my younger brother and I sat around popping bubbles. In some cases however, the air would only shift into the next closest bubble. As I learned from Wikepedia3, popping bubble wrap not merely silly, but actually a 'stress relieving activity'. Footnote 1: After a lengthy period of mind twisting, I recalled that I read the story in an airline magazine. Obviously, that memory didn't include the name of the airline, the magazine, the title of the article, or its author. But thanks to Google, I was able to actually find the article I read: Smart Stuff, by Dan Gross, in the US Airways Magazine. Footnote 2: This equally stupid and ignorant praise of the merits of capitalism. Footnote 3: You also learn from Wiki that bubble wrap has an appearance in the song White and Nerdy by Al Yankovic, see also Clifford's post at Asymptotia. Go to Google, search for 'failure', and hit the I'm-feeling-lucky-button. Or click here. Yesterday, I sorted through my mailbox at the institute, which revealed (besides several past due bills for my BlackBerry) an envelope from the Particle Data Group (PDG) with the new edition of the Particle Data Booklet. The booklet, which comes in a different color every year, is probably the most reliable companion of my postdoc life. Besides all the known details about the elementary particles, and constraints on parameters in different models, it lists all these constants that theoretical physicists like to set equal to one, and things like the distance to the sun or the baryon density of the universe. But maybe most importantly, it contains the definitions of kinematical quantities (pseudo-rapidity, anybody?) and how to transform these from the lab frame in the center of mass frame and stuff like that. Besides this, it gives you the absolutely minimal introduction into the standard model. I was kind of disappointed though because I also expected the complete review, and the 'particle physicist's pocket diary'. I usually put the booklet in the glove box of my car, and the review on my desk. The pocket diary has a good listing of physics institutes in the US, which is pretty handy for applications. But the only other thing the envelope contained was a brochure. A [...] problem occurred in the 1994 Booklet, so PDG thought it necessary to provide their readers with explanations as noted below. g) PDG gives you more cm/inch than anyone else. In case you haven't yet noticed it, the PDG has now a website called PDGlive, which doesn't only list all the data, but has direct links to the references on SPIRES. See also: PDG 50th anniversary festivities.